by: ranjan317 description : Fluid mechanics is the branch of physics that studies fluids (liquids, gases, and plasmas) and the forces on them. Fluid mechanics can be divided into fluid statics, the study of fluids at rest; fluid kinematics, the study of fluids in motion; and fluid dynamics, the study of the effect of forces on fluid motion. It is a branch of continuum mechanics, a subject which models matter without using the information that it is made out of atoms, that is, it models matter from a macroscopic viewpoint rather than from a microscopic viewpoint. A structure, used to dam up a stream or river, over which the water flows, is called a weir. The conditions of flow, in the case of a weir, are practically the same as those of a rectangular notch. That is why, a notch is, sometimes, called as a weir and vice versa. The only difference between a notch and a weir is that the notch of a small size and the weir is of a bigger one. Moreover, a notch is usually made in a plate, whereas a notch is made of masonry or concrete. A notch may be defined as an opening in one side of a tank or a reservoir, like a large orifice, with the upstream liquid level below the top edge of the opening. Since the top edge of the notch above the liquid level serves no purpose, therefore a notch may have only the bottom edge and sides. The bottom edge, over which the liquid flows, is known as sill or crest of the notch and the sheet of liquid flowing over a notch (or a weir) is known as nappe or vein. 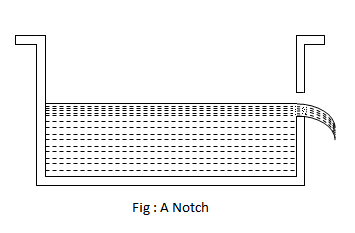 A notch is, usually made of a metallic plate and is used to measure the discharge of liquids. There are many types of notches, depending upon their shapes. But the following are important from the subject point of view.